While many butterflies actively lay eggs during many times of the year, it seems that late summer and early autumn is the peak of activity. My recent trip to San Pedro last week turned up many caterpillars and larvae, as did the trip to Boyce Thompson two weeks ago. Even in my back yard there is a nice batch of Queen Butterfly larvae. Just like in adult form, the larval form of the queen looks very similar to a Monarch. And like the Monarch, they are fond of Milkweeds. 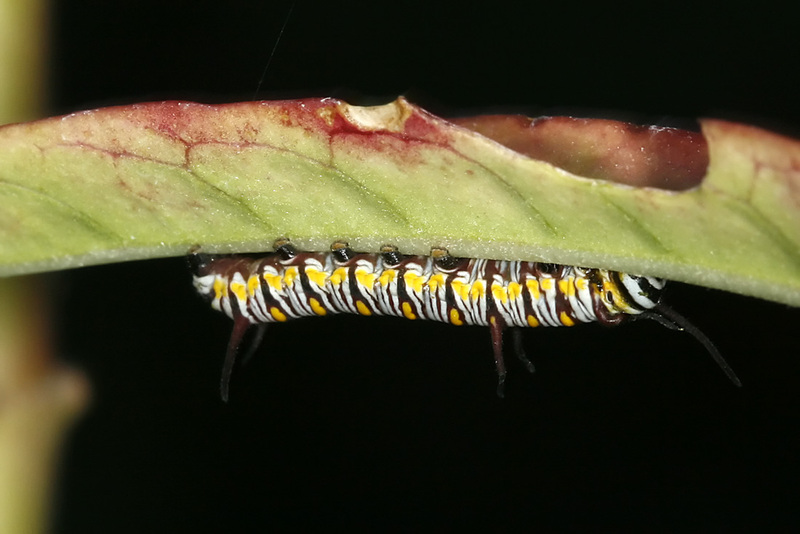 These larvae in my backyard in Maricopa were found on a Mexican Bloodflower (Asclepias curassavica), which is also sometimes called Mexican Milkweed. We'd planted Mexican Bloodflower both because of its excellent flowers, which butterflies seem to like, but also because of the attraction that Queens and Monarchs have to it. 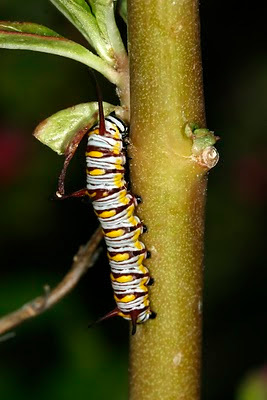 As mentioned in my last Queen post, the attraction to Milkweed is believed to be because it results in a toxic build-up in the larva and ultimately in the adult butterfly. Birds and other predators have learned about this and typically leave the burnt-orange colored butterflies alone. Hopefully the caterpillars in my yard will survive to the next stage (pupa, or chrysalis; not cocoon, which is specific to moths), but unfortunately the Milkweed that these larvae are on is not in great shape, and has been struggling to survive the summer. I've been considering relocating a few of the caterpillars to a healthier milkweed. Update: The caterpillars did progress to chrysalis - see the Queen Pupa post for more.